Students will learn how to use the formal elements of art (line, tone, colour, form, texture, shape, perspective) using a wide variety of materials. This will include drawing, painting, printing, collage, sculpture and digital art such as using image manipulation software such as Adobe Photoshop and making animations. Students develop their visual literacy to help them understand the world around them and learn to find meaning in works of art from all eras. Students are actively encouraged to produce creative work from a personal perspective and explore individual expression. By studying GCSE Fine Art, students are supported to experiment widely and refine their skills through examining the world around them, analysing and reflecting on what is important to them and finding inspiration in the work of influential Artists and creators. In this way, students are able to express their own voice in a variety of modern and traditional art media, including paint, collage, clay modelling, photography and sculpture. 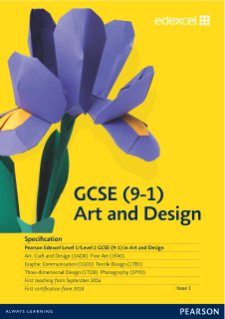 Students will follow the Edexcel GCSE 3D Design programme of study to discover and examine the principles of the 3-dimensional world around us. They will then use this knowledge to develop and build their own 3D designs, thus enhancing their technical, engineering, structural, mathematical and practical design skills in a variety of modern and traditional art and design media. Students are actively encouraged to produce creative work from a personal perspective and explore individual expression. By studying GCSE Graphic Communication, students are supported to experiment widely and refine their skills through examining the world around them, analysing and reflecting on what is important to them and finding inspiration in the work of influential Designers and artists. In this way, students are able to express their own voice in a variety of design media, including animation, digital photography, mono and lino printing, collage, embossing and typography. By studying GCSE Photography, students produce creative work from a personal perspective and explore individual expression. They are guided to experiment widely: they will refine their skills by examining the world around them, by analysing and reflecting on what is important to them and by finding inspiration in the work of influential Photographers and Artists. Through a range of creative and practical activities, students will learn how to cook and apply the principles of nutrition and healthy eating. Instilling a love of cooking in students will also open a door to one of the great expressions of human creativity. Learning how to cook is a crucial life skill that enables students to feed themselves and others affordably and well, now and in later life. 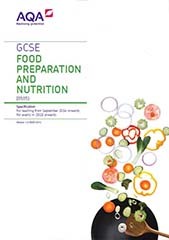 At GCSE, students will learn practical cooking skills as well as develop a thorough understanding of nutrition, where foods come from and the working characteristics of food materials. Students will gain an understanding of the working characteristics of food and the functional and chemical properties of ingredients; they will contextualise this learning through trips to restaurants, meeting highly successful chefs and food retailers. Students will have the opportunity to undertake practical work in the kitchen and create their own menus and food plans as well as learning about food theory. Through a range of creative and practical activities, students will learn to research, design and make high-quality prototypes and products for a wide range of users. They will learn to safely use a selection of tools, machinery and equipment in order to manipulate many different types of materials such as wood, plastics and metals. Students will learn practical making and designing skills. 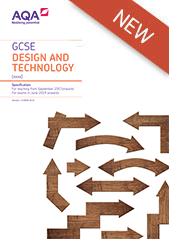 They study a broad range of Design Technology subject areas before specialising in Resistant Materials. Students will research different products and the people who use them, before creating their own unique designs. The process will involve drafting and evaluating design images to communicate their design’s concepts. Students will gain an understanding of the working characteristics and properties of many different materials and textiles; they will handle a broad range of specialist tools, machinery and equipment as well as specialist ICT such as 2D Design and CADCAM.